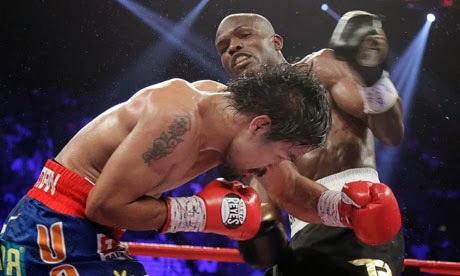 Timothy Bradley defeated Manny Pacquiao via split decision in the WBO battle on Sunday, June 10, 2012. Dubbed as the toughest fight of the year, the boxing match has been controversial as analysts said Pacquaio should be the declared winner. 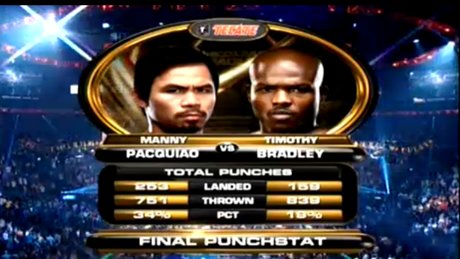 Round 1 is definitely for Bradley, he has 36 more punches than Pacquiao at the first round. At Round 4, Pacquiao lets out a flurry of punches. Bradley is wobbly on his feet. Referee warned Bradley to keep his punches up. Bradley comes in with a jab at the start of Round 6. Bradley became more cautious. Bradley looked a little shaky last round, but he's more aggressive. At Round 9, Bradley jabs then hooks to th body. Pacquiao retaliates with a jab and a big left. Bradley having problem on footwork. Bradley landing a combination of the top of the round. Round 10 is Bradley's best round yet and became more active at 11th. 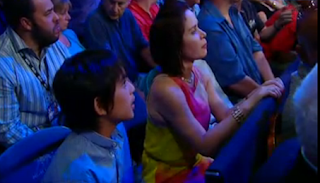 Manny Pacquiao during the interview accepts the rematch on Nov. 10, 2012. He is seen smiling after the match. Looks to have been unhurt during the entire match.